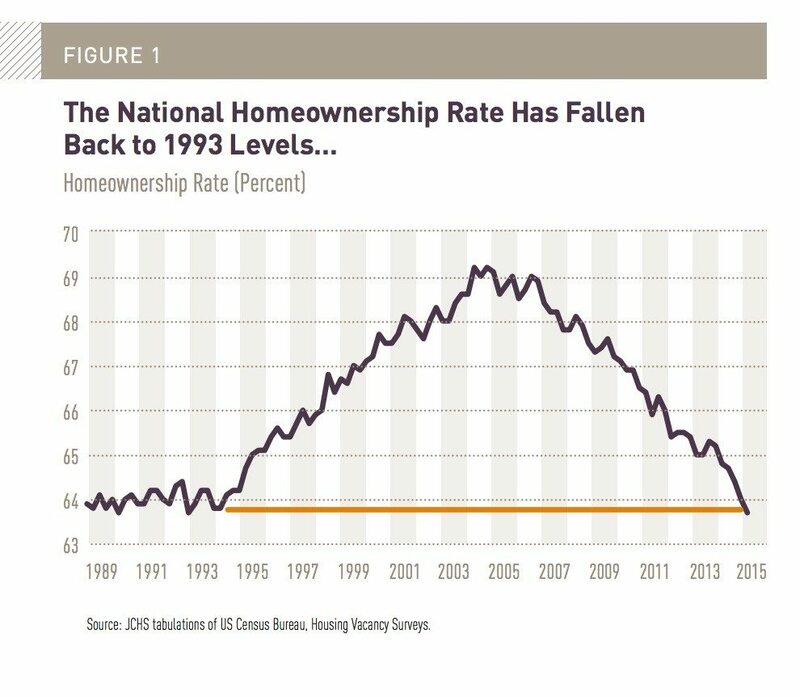 Although the real estate industry has enjoyed about two decades of housing market growth, the national homeownership rate decreased to just 64.5 percent last year, falling back to levels not seen since 1993 and taking 20 years of momentum with it. That’s according to “The State of the Nation’s Housing,” a report issued this week by the Joint Center for Housing Studies (JCHS) of Harvard University. The annual report provides a periodic assessment of the nation’s housing outlook and summarizes important trends in the economics and demographics of housing. This year’s report finds that the national homeownership rate fell for the eighth straight year — and that trend is likely to continue, with the rate falling even further to 63.7 percent in the first quarter. 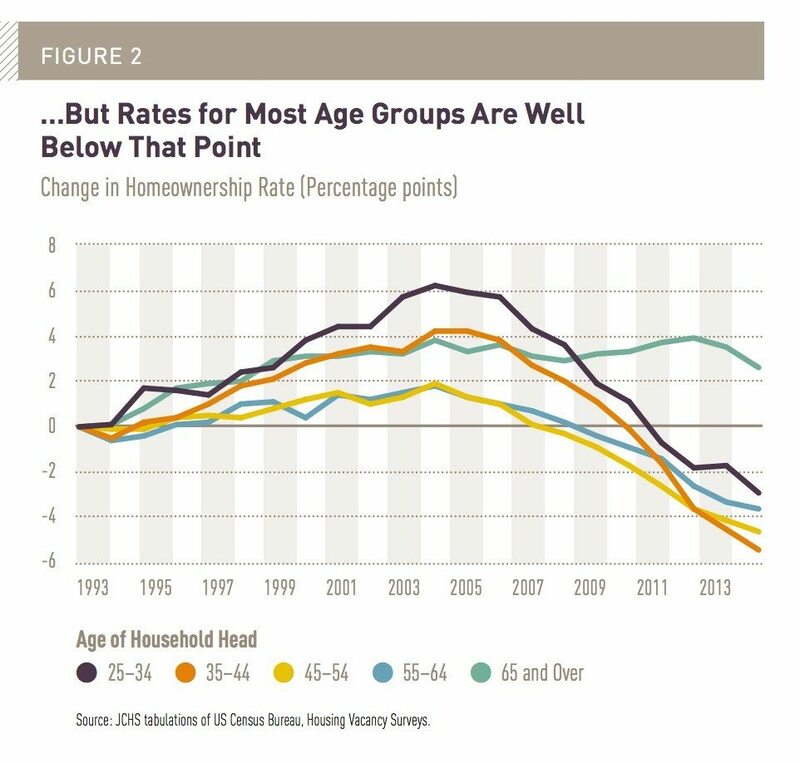 However, the report’s outlook was more positive, concluding that despite the slowdown in 2014, the housing market recovery could regain steam in 2015 if continued employment growth helps to lift household incomes, and if millions of millennials are able to find their footing in the job market and become first-time homeowners. About 650,000 single-family homes were started last year, which is a significant increase from the recession years. But it’s still surprisingly low by historical standards, and Chris Herbert, JCHS’ managing director, attributed this trend to changes in household formation. Declines in headship rates among young adults and in net immigration have impacted the formation of households, and growth ran at about 500,000 for much of 2014. However, the report noted that the most recent data suggests that the share of young adults moving into independent households — especially millennials — as well as immigration is resuming, and this could result in household growth returning to its longer-run average of just under 1.2 million annually in 2015 and 2016. “There is a whole other set of reasons about why it is we’re not buying homes, and why we’re choosing to rent,” Herbert said. According to the report, last year was the 10th year of consecutive growth for rental housing. Herbert attributed this trend to weaknesses on the demand side and challenges on the supply side. Paul Weech, president and CEO of NeighborWorks America, said that prospective borrowers and lenders alike may be suffering from post-traumatic stress disorder following the foreclosure crisis. Typical first-time homebuyers may be under different kinds of financial stress right now, Weech added. “Their incomes are lower on average than they have been in the past. For many of them, student loan debt is higher and more pronounced than it has been in the past,” he said. At the same time, lending communities are also suffering from PTSD, Weech said. Lending communities are suffering from PTSD. “Banks lost a lot of money, and their risk officers were embarrassed,” he said. However, Don Chen, director of metropolitan opportunity at the Ford Foundation, said he is concerned about the wealth gap between African-Americans and Latinos and Caucasians. The report noted that distressed neighborhoods have disproportionately large shares of minority and low-income residents. In more than half of the areas where house prices were still depressed by more than 35 percent, minorities make up the majority of households. The median poverty rate is also close to 19 percent, or about twice that of all neighborhoods.